Janelle Monáe (born Janelle Monáe Robinson on December 1, 1985 in Kansas City, Kansas) is an American singer, songwriter, dancer, producer, and performer. She moved to New York to study theatre at the American Musical and Dramatic Academy. Her original plan was to pursue a career on Broadway, but she soon changed her mind and returned to music. 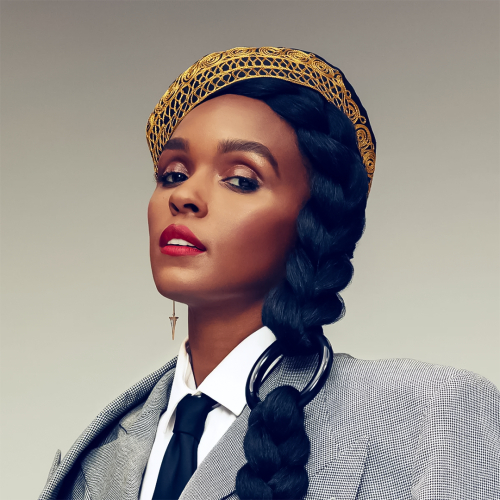 After moving to Atlanta, Georgia in 2003, Monáe founded the Wondaland Arts Society with like-minded young artists, and made a couple of appearances on OutKast's 2006 album Idlewild, where she is featured on the songs "Call the Law" and "In Your Dreams". By 2007, Monáe was ready to release her first solo work, titled Metropolis. It was originally conceived as a concept album in four parts, or suites, which were to be released through her website and mp3 download sites. After the release of the first part of the series, Metropolis Suite I of IV: The Chase in mid-2007, these plans were altered following her signing with Sean "Diddy" Combs' label, Bad Boy Records, later in the year. The label gave an official and physical release to the first suite in August 2008, which was retitled Metropolis: The Chase Suite (Special Edition) and included two new tracks. The EP was generally well-received by critics, gaining Monáe a 2009 Grammy nomination in the Best Urban/Alternative Performance for her single "Many Moons", festival appearances, and opening slots for the indie pop band Of Montreal. Monáe also toured as the opening act for band No Doubt on their summer 2009 tour. In a November 2009 interview, Monáe revealed the title and concept behind her album The ArchAndroid. The second and third suites of Metropolis are combined into this full-length release, in which Monáe's alter-ego, Cindi Mayweather - also the protagonist of Metropolis: The Chase Suite - becomes a messiah-like figure to the android community of Metropolis.